Brabus is known in the industry for its ability to turn standard Mercedes models into rockets on four wheels. The German tuner has a long list of modifications that fit this bill. 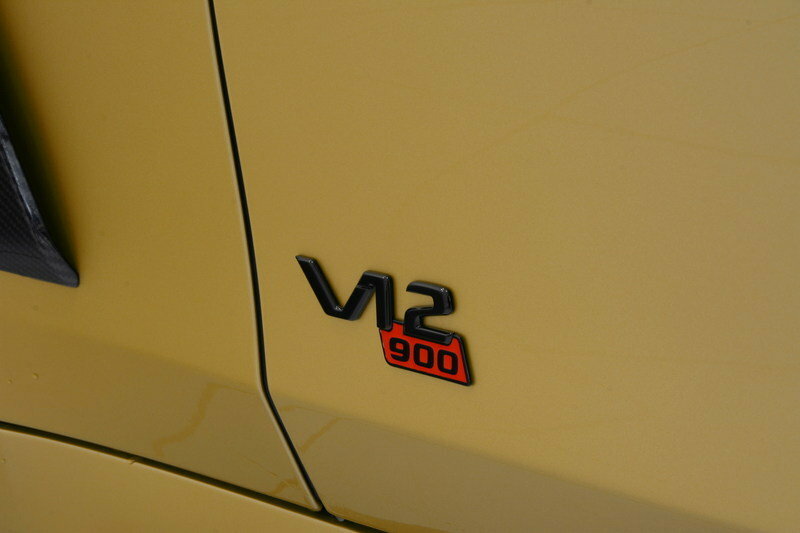 Now, it’s adding another one to that list in the form of the S65 AMG Rocket 900 Desert Gold Edition. Launched at the 2015 Dubai Motor Show, the ultra exclusive Rocket 900 Desert Gold Edition packs the kind of power that’s fit for royalty. It’s got a comprehensive list of refinements that’s right in line with what we’ve come to expect from Brabus. From aerodynamic kits to engine modifications, the Desert Gold Edition has it all, so much so that it’s easy to forget that the aftermarket shop even went a little out of its wheelhouse to develop a special Desert Gold paint finish exclusively for this particular model. We see what you did there, Brabus. About the only thing missing from this car is availability. 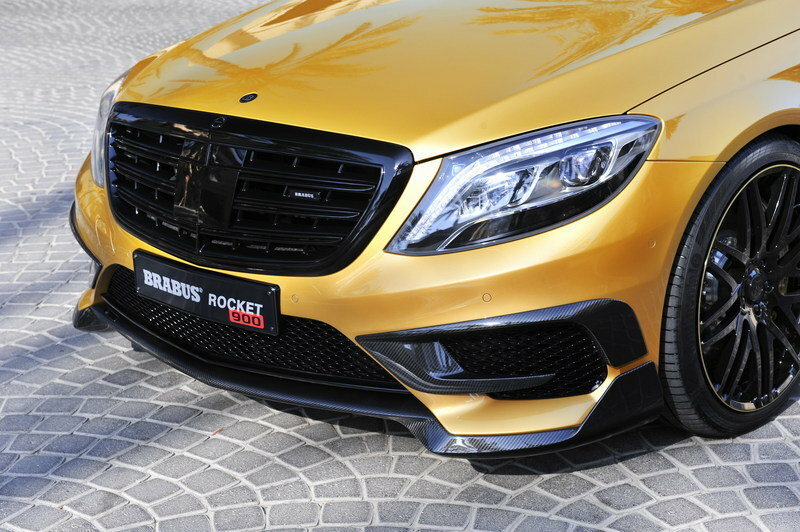 Sadly, Brabus is expected to offer the Rocket 900 Desert Gold Edition in extremely limited quantities. Since it made its debut in Dubai, there’s a good chance that its got dibs on all the available units. Seems appropriate considering that Brabus has a newly minted showroom in the country. The Rocket 900 Desert Gold Edition would make for an incredible showpiece model. 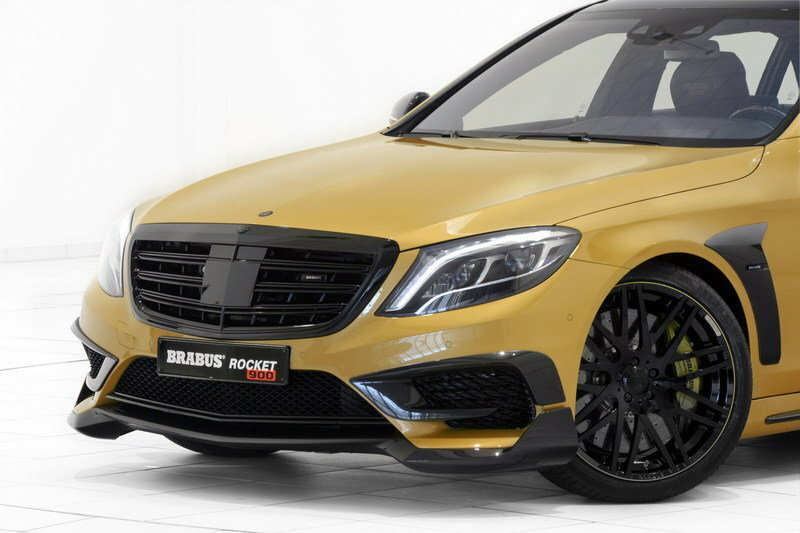 Continue reading to learn more about the Mercedes S65 AMG "Rocket 900 Desert Gold Edition" By Brabus. Brabus’ exterior modifications on the S65 AMG is about as extensive as it’s going to get. The defining feature of the car is its Desert Gold paint finish that Brabus developed specifically for this program. The visual enhancement provided by the unique paint color is complemented by a number of carbon fiber components that have been installed throughout the body of the sedan. There’s a new wind tunnel-optimized front spoiler lip that helps reduce lift on the front axle. The sedan’s front fenders also gets a nice visual upgrade courtesy of a unique design element made from naked carbon. The exterior mirrors have also been dressed up in carbon covers. At the back, the aerodynamic enhancements continue with a new rear spoiler lip and diffuser, both made from naked carbon. The diffuser, in particular, was with cutouts to complement the new sports exhausts system, the tips of which are painted in glossy black. Rounding out the exterior upgrades is a new set of 21-inch Monoblock F “Platinum Edition” wheels that can be wrapped in 255/35 ZR 21 or 295/30 ZR 21 tires from any of Brabus’ tire partners: Continental, Pirelli, or Yokohama. As fancy as the exterior upgrades are, the interior refinements are just as flamboyant. The same Desert Gold finish can also be found in the interior, covering around 300 parts in the cabin, including all the switches and bezels. These finely appointed details are a nice contrast to the black and gold Mastik leather that’s fitted into the entire cabin. Gold-colored seams and piping add the accent touch to the entire two-tone color scheme, echoing the exterior’s elegant Louis Vuitton-ish visuals. As a finishing touch, Brabus also embroidered “900” logos on the head rests and dressed up the headliner with a nice and rich, deep black Alcantara. As fancy as the S65 AMG Desert Gold Edition looks, the real highlight of the program is the engine upgrade Brabus gave to the sedan’s massive V-12 engine. For starters, a custom billet crankshaft that allows a longer stroke was put in place to work in concert with bored out cylinders to push the engine’s capacity from 6.0 liters to 6.3 liters. Brabus also installed matched forged pistons and custom billet connecting rods to achieve the increase in displacement. 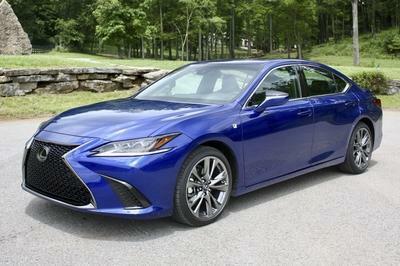 The sedan’s turbochargers have also been enlarged, complete with larger compressors and turbines. Even the air intake has a new duct and a new filter with reflective gold sheathing to keep the air temperature at bay. The result of this extensive engine modification is a V-12 powerhouse that produces an incredible 888 horsepower at just 5,500 rpm and 884 pound-feet of torque at an incredible 4,200 rpm. It’s worth noting that the actual peak torque of the program is 1,106 pound-feet, but for the purposes of keeping the engine from going bonkers, Brabus opted to cut it down to the indicated number. All that power can be sent to the rear wheels courtesy of AMG’s tried-and-tested seven-speed automatic transmission, which works hand-in-hand with a limited-slip differential that boasts a locking rate of 40 percent. The result is a car that does its “Rocket” moniker proud. In full blast, the S65 AMG Desert Gold can sprint from 0 to 62 mph in just 3.7 seconds and 0 to 124 mph in 9.1 seconds, to go with a top speed of 217 mph. Brabus fitted the S65 AMG with its own AROMATIC SPORT Unit, a special control module that’s been developed specifically to lower the car’s ride height by .6 inches, thus improving its handling without taking away from its ride quality. Brabus has not revealed pricing for the Rocket 900 Desert Gold Edition but considering that it’s making its debut at the Dubai International Motor Show, something tells me that the car will be tagged as an exclusive and limited to a number of models, all of which will be earmarked for that high-end market. As far as a guesstimate on the price is concerned, I anticipate it will carry a price tag north of $250,000, the S65 AMG included. The Mercedes S65 AMG belongs in a segment that isn’t littered with a lot of competition. 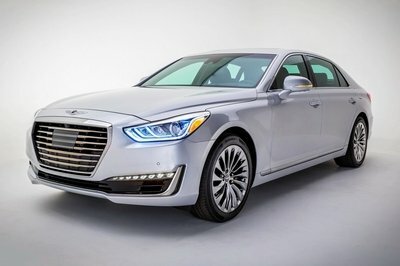 Only a handful of other automakers have cars that can compete against the S65. Fortunately, Bentley is one of them because it has the Continental Flying Spur. To be fair to Bentley, the Flying Spur has always been its banner model in the high-performance, luxury sedan market. It has its own 6.0-liter W-12 engine that produces 616 horsepower and 590 pound-feet of torque. That amount of power helps the sedan shoot from 0 to 60 mph in a shade over four seconds and hit a top speed in excess of 200 mph. 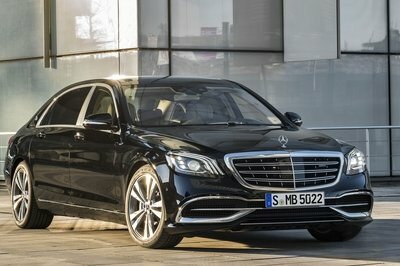 It also has the kind of luxury appointments that can go toe-to-toe with anything Mercedes has for the S65 AMG. Given all that, the issue with the Flying Spur is that unlike the S65 AMG, this model is ripe for an update and the Flying Spur V-8 doesn’t count. It’s been close to three years since the last version of the Flying Spur was released in the market. That might not be a lot of time for some people, but it’s tantamount to eternity in the auto industry. So, as the S65 AMG continues to evolve and aftermarket companies continue to give it the love and shine it deserves, it’s important to remember what’s at stake here for Bentley. Every year that passes without a new flying Spur being introduced in the market is another year for the S65 AMG to tout itself as the standard-bearer of its segment. 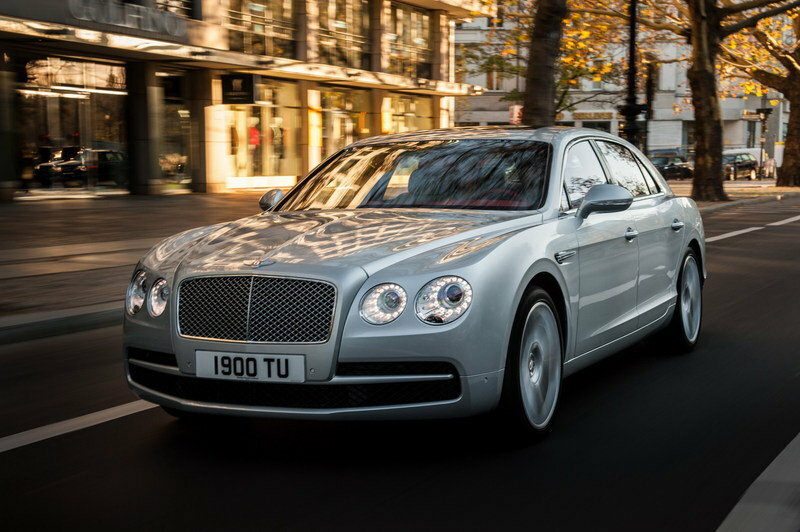 Read our full review on the Bentley Flying Spur here. The S65 AMG may have all the tools to be considered a serious competitor in the segment, but any talk of high-performance, luxury sedans usually starts with the Rolls-Royce Ghost. Now in its second generation, the aptly named Ghost Series II is one of those sedans that doesn’t seem to mind that it’s drowning in luxury. Unlike the Flying Spur, the Ghost Series II boasts plenty of new luxury features while also keeping some elements that have been carried over from the previous generation. The sedan’s 6.6-liter, twin-turbo V-12 engine is one of the things that has stayed with the Ghost Series II. This engine is capable of producing 562 horsepower and 575 pound-feet of torque, good enough to allow the Ghost to sprint from 0 to 60 mph in 4.7 seconds. Top speed is electronically limited to 155 mph, but that shouldn’t mean much in the grand scheme of things for the Rolls. See, the Ghost is powerful. It’s also pretty fast in its own right. But it’s the luxury that’s attached to the Rolls-Royce name that really sets it apart from every other car in its segment. The prestige of owning a Rolls often drowns out any perceived shortcomings it may have compared to a model like the Mercedes S65 AMG. 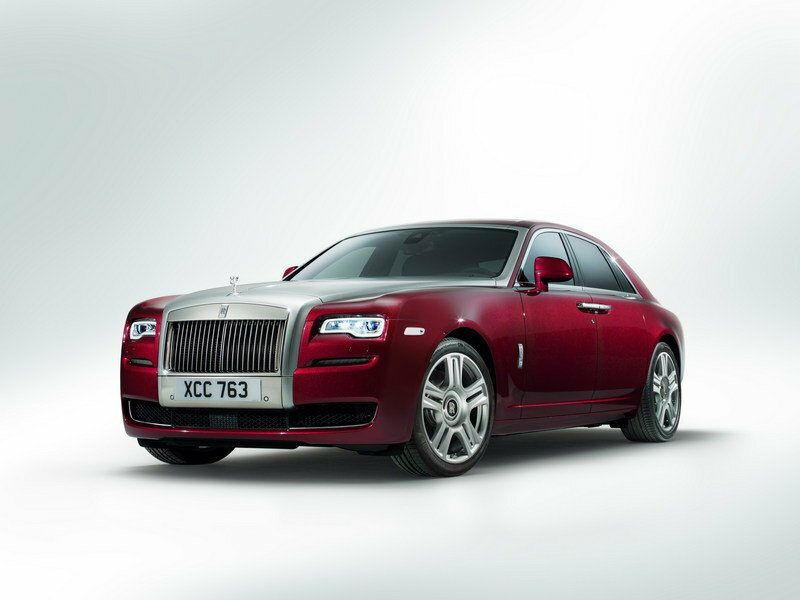 Read our full review on the Rolls-Royce Ghost Series II here. The Mercedes S65 AMG Desert Gold Edition is the kind of creation that really sets Brabus apart from other Mercedes-centric tuners in the market. The amount of modifications and the attention-to-detail behind these mods are on a level all of its own. There’s a reason why Brabus is considered as one of the best in the business and this exclusive S65 AMG is yet another proof of that. The only problem I have with the model itself is its availability. I understand the rationale of limiting its number and earmarking all of the units in a specific market, but couldn’t Brabus at least thrown some here in the US? Other than that slight hang up, I don’t have anything to say about the S65 AMG Desert Gold other than ‘wow’. BRABUS ROCKET 900 – that is the new reference for high performance in the luxury segment. BRABUS (Brabus-Allee, D-46240 Bottrop, phone +49 / (0) 2041 / 777-0, fax +49 / (0) 2041 / 777 111, Internet www.brabus.com) builds this supercar based on the Mercedes S 65. 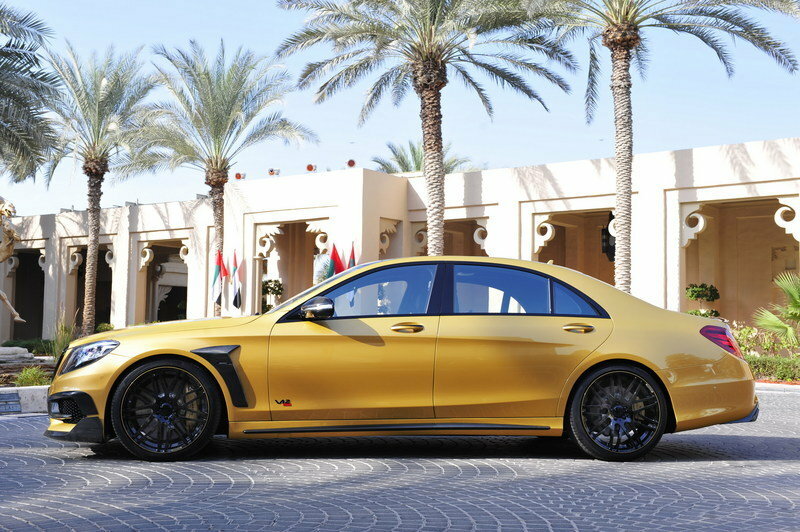 BRABUS developed the especially exclusive BRABUS ROCKET 900 “DESERT GOLD” Edition, which celebrates its world debut at the DUBAI INTERNATIONAL MOTOR SHOW 2015, as an homage to the Orient, where BRABUS maintains a company branch and a prestigious BRABUS Flagship Store in Dubai. The exclusive high-performance luxury liner is immediately recognizable not only due to its extraordinary “DESERT GOLD” special paintwork. The appearance of this special model is also characterized by BRABUS carbon aerodynamic-enhancement components and shiny black BRABUS Monoblock F "PLATINUM EDITION" 21-inch wheels with gold pin striping. The BRABUS fine leather interior is finished in a combination of gold and black leather. Gold-colored seams in a quilting pattern created specifically for this special model furthermore distinguish the classy interior appointments. The power plant for this luxury sedan is the BRABUS ROCKET 900 6.3 V12 twin-turbo increased-displacement engine rated at 662 kW / 900 HP (887 bhp) and producing a peak torque of 1,500 Nm (1,106 lb-ft). This engine propels the four-door car from rest to 200 km/h (124 mph) in just 9.1 seconds. The top speed is in excess of 350 km/h (217 mph). 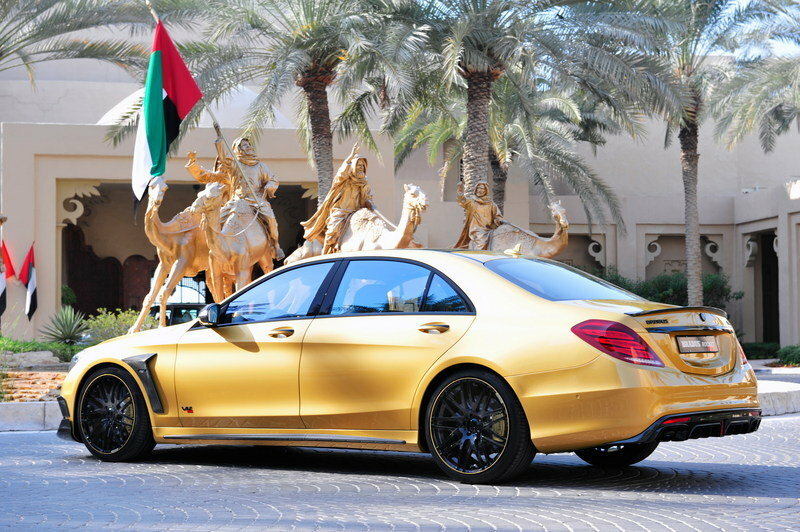 As the name BRABUS ROCKET 900 “DESERT GOLD” indicates, this automotive homage from BRABUS to the desert state of Dubai was painted “Desert Gold,” a color created specifically for this high-performance sedan. In addition, in the interior were also painted the same shade. Carbon aerodynamic-enhancement components and high-gloss black bodywork components add tasteful contrasts. All chrome parts on the vehicle were painted black as were the BRABUS Monoblock F “PLATINUM EDITION” forged wheels, which were additionally adorned with gold-colored pin striping. Of course, the aerodynamic properties are also essential at the extremely high speeds the BRABUS ROCKET 900 “DESERT GOLD” so effortlessly attains. To minimize lift on the front and rear axle as well as to bring them into an optimal balance, the BRABUS designers developed a bodywork conversion with sporty and elegant styling. The naked carbon components with high-gloss coating lend the luxury sedan a dynamic visual upgrade and a sporty contrast to the gold paint finish. In addition, they also optimize aerodynamic efficiency. The BRABUS front spoiler lip and the attachments for the front bumper give the four-door car a more thrilling appearance. What is more: Thanks to their shape optimized in the wind tunnel, these components also reduce lift on the front axle, which at high speeds contributes to further improved handling stability. The front fenders are upgraded visually with a BRABUS design element made from naked carbon. The integrated BRABUS logo is illuminated and the lights are activated with the keyless-entry remote or by pulling on a door handle. BRABUS carbon covers for the exterior mirrors represent a further sporty upgrade. 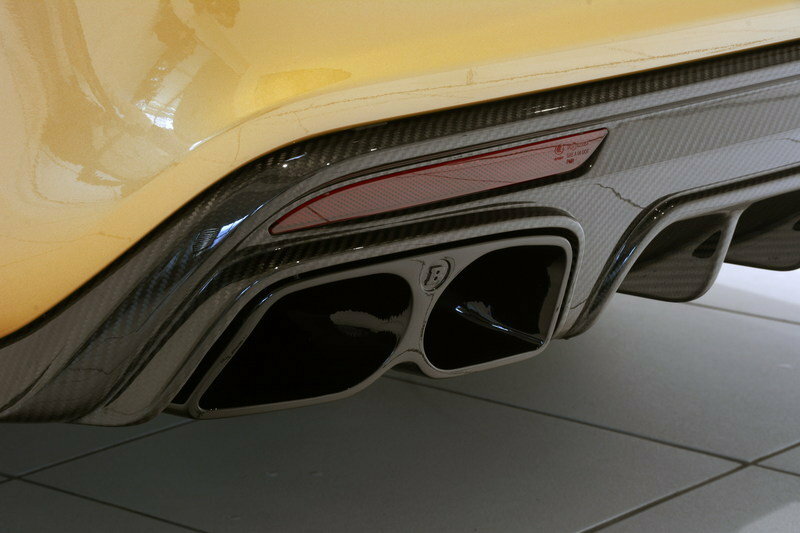 The BRABUS rear spoiler lip and a diffuser made from naked carbon round off the BRABUS aerodynamic-enhancement concept. Tailor-made cutouts in the diffuser provide the perfect backdrop for the dual designer tailpipe tips of the BRABUS sports exhaust system. The tips are also painted a glossy black to match the overall concept. In addition, BRABUS Monoblock F “Platinum Edition” high-tech cross-spoke forged wheels decisively characterize the look of the exclusive special model. BRABUS technology partners Continental, Pirelli and YOKOHAMA supply the optimal high performance tires of sizes 255/35 ZR 21 at the front and 295/30 ZR 21 on the rear axle. They are mounted on wheels of sizes 9Jx21 and 10.5Jx21. The BRABUS AIRMATIC SPORT Unit, a special control module for the air suspension of the luxury sedan, was developed to be able to enhance the high level of dynamic handling of the high-performance luxury car further still. It lowers the ride height of the supercar by about 15 millimeters (.6 in) without compromising the outstanding ride quality. Of course, the BRABUS ROCKET 900 “DESERT GOLD” impresses not only with its extraordinary appearance, but above all with its superior performance. The 12-cylinder engine of the S 65 is revised in every detail in the BRABUS engine shop, which is equipped with a state-of-the-art machine park. The installation of a custom BRABUS billet crankshaft with longer stroke in concert with a larger cylinder bore, matching forged pistons and precision-balanced custom billet connecting rods increases the displacement from 5.5 to 6.3 liters (336 to 384 cubic inches). Modifications to the engine peripherals also play a large role in the enormous power output. The two production turbos are replaced with turbochargers that have a larger compressor unit and a larger turbine as well as modified exhaust manifolds. Down pipes with a diameter of 80 millimeters (3.1 inches) are also included in the conversion, as is a stainless-steel BRABUS high-performance exhaust system with free-flow metal catalysts and actively controlled butterfly valve. Just as crucial is a perfect air supply of the engine. 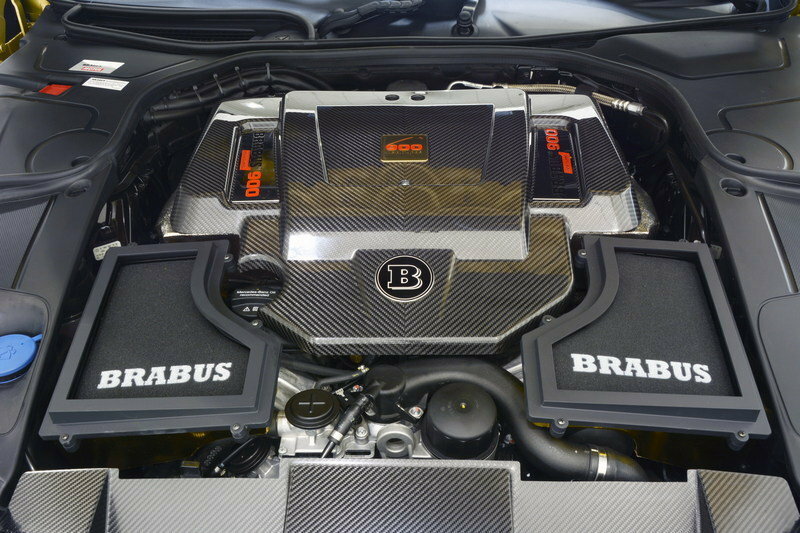 To this end, the BRABUS engine specialists developed the BRABUS 900 intake module, which draws its air through an air duct in the hood directly from the radiator grille. The new intake manifold includes a special air filter box with larger cross-section and special filters as well as “Gold Heat Reflection” sheathing for lowering the temperature. Precisely programmed mapping for injection and ignition coordinate the perfect interaction of the high-performance components. The result is not only maximum power, but also compliance with the strict limits set by the current EURO VI emissions standards. Technology partner MOTUL supplies the high-tech lubricants for the entire powertrain. The extensive work performed on the engine results in the BRABUS ROCKET 900 6.3 V12 twin-turbo engine delivering unrivalled performance figures: the peak power of 662 kW / 900 hp (887 bhp) is produced at a low 5,500 rpm. Even more massive is the peak torque of 1,500 Nm (1,106 lb-ft) at 4,200 rpm. In the car, this figure is limited electronically to 1,200 Nm (884 lb-ft). The power is channeled to the rear wheels by a seven-speed automatic transmission adapted to the tremendous power output and a BRABUS high-performance limited-slip differential with a locking rate of 40 percent. The transmission can also be shifted manually with the BRABUS RACE aluminum paddle shifters on the steering wheel. 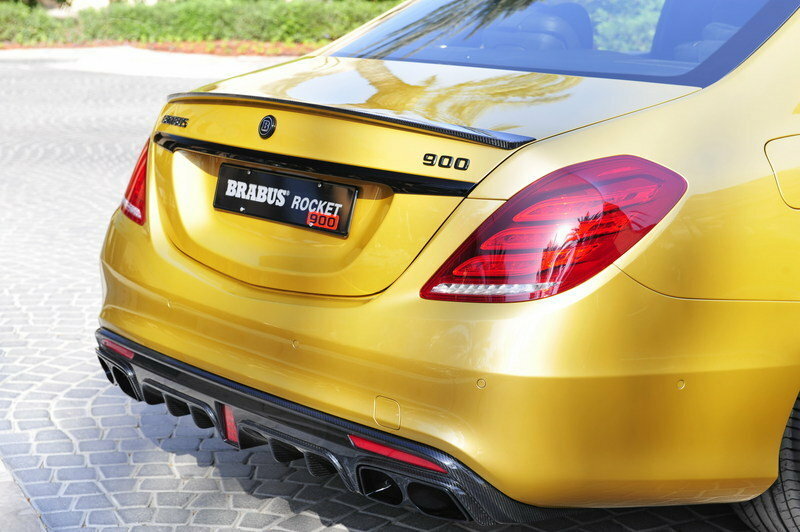 The performance of the BRABUS ROCKET 900 “DESERT GOLD” is on the level of full-blooded top-class sports cars. 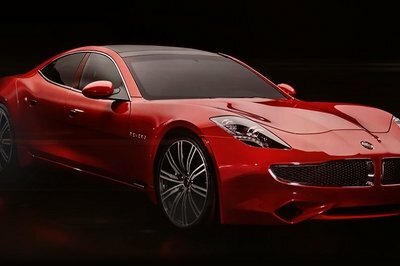 From rest, the luxury sedan sprints to 100 km/h (62 mph) in just 3.7 seconds. The sprint to 200 km/h (124 mph) takes a measly 9.1 seconds. Top speed is in excess of 350 km/h (217 mph). A subtle or thrilling exhaust note accompanies this unique driving experience. The BRABUS sports exhaust system with actively controlled butterfly valve enables the owner to actively manage the sound at the touch of a button on the steering wheel. 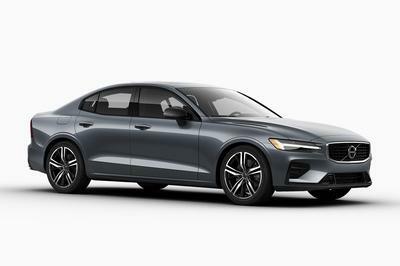 It lets the driver choose between driving the luxury sedan in a subtle and quiet “Coming Home” mode and enjoying a markedly powerful twelve-cylinder sound. Of course, the interior of the BRABUS ROCKET 900 “DESERT GOLD” is also especially exclusive. With utmost love of detail, the BRABUS upholsterers transformed especially soft and breathable black and gold Mastik leather into a BRABUS fine leather interior in a class of its own. The embroidered “900” logo on the head restraints provides an indication of what engine is under the hood in the interior as well. Gold-colored seams and piping add subtle accents. The interior elements such as switches and bezels also received an elaborate custom gold-colored coating. The headliner of the sedan is made from deep black Alcantara. The BRABUS ROCKET 900 “DESERT GOLD” can be upgraded further with a state-of-the-art multimedia system by customer request.